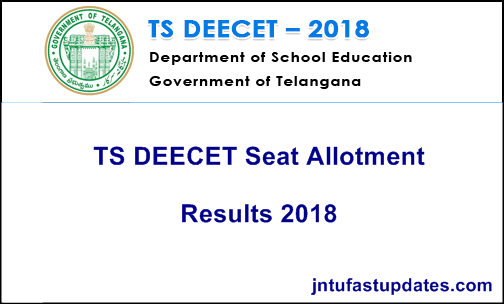 TS DEECET Seat Allotment 2018 Results: Commissioner and Directorate of School Education, Government of Telangana released the Telangana DEECET Second Phase seat allotment result on 24th July. Candidates appeared for the Diploma in Elementary Education Common Entrance Test (DEECET) entrance test and have qualified in this test can check the Telangana DEECET seat allotment result from the official website, tsdeecet.cgg.gov.in. The DEECET examination was organized on 1st June and the result was out on 12th June. Candidates qualified with good merit will have the chance to get admission into courses D.el.ed & D.P.S.E for the academic year 2018 -19. Candidates waiting for Telangana DEECET seat allotment result can check the official portal and can download TS DEECET seat allotment order if they got allotted the admission. Hopefuls have to pay the requisite processing fee after they got allotted admission and have to report at the allotted college on the scheduled date. Candidates can go through further details from this article. Commissioner and Directorate of School Education, Government of Telangana annually conducts the Diploma in Elementary Education Common Entrance Test (DEECET) entrance test for admission into 2-year Diploma in Elementary Education course. This examination is annually being organized by the TS School Education Department is to offer admission in 2 years Diploma in elementary education in Private and Government District Institutes of Educational Training in Telangana. Yearly, many of the hopefuls compete for this examination to get admission in D.Ei.Ed courses. Candidates will be allotted admission purely on the basis of merit. Candidates who have come across the DEECET examination and qualified the examination with good merit can check the details about Telangana DEECET seat allotment list from the following article. Search for the DEECET Seat Allotment Result on the homepage. Click On the link and it prompts to enter the credentials. After furnishing the required details click the submit button. The TS DEECET seat allotment result 2018 will be downloaded. Check it, and take a printout if required for further reference.